Los Angeles, CA (PRWEB) July 1, 2011 -- Call Box's latest training course offers tips and tricks for users of the GoPro HD Hero camera with a focus on post-production using Apple's Macs and OS X. 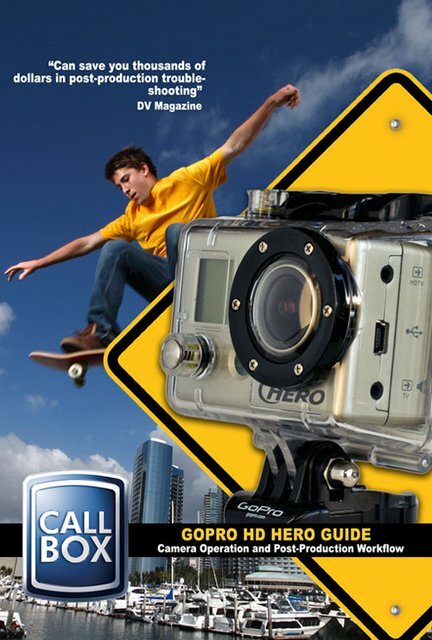 Now available at: GoPro HD Hero Guide. Executive produced by Apple Certi&#64257;ed instructor Noah Kadner and featuring indie &#64257;lmmaker (Big in Bollywood) and E! professional editor, Kenny Meehan, the course takes users through the complete operation of the GoPro HD Hero camera in production and post-production. &quot;GoPro HD Hero Guide&quot; features original content broken down into learning modules with interactive demonstrations and easy to understand, real-world examples. The course focuses on a broad variety of techniques and tips for achieving breathtaking extreme sports and cinematic imagery. Topics include Technical Overview, Menu Tour, LCD Backpack Operation, Exposure Modes, Timelapse Tips, Slow-Motion Cinematography, Camera Mounting Tricks, Dolly Tracks, Final Cut Pro Work&#64258;ow, MPEG Streamclip and much more. The course is aimed at beginning and aspiring GoPro owners and features over an hour of footage broken down into 22 chapters. Call Box Inc., headquartered in Los Angeles, CA, is a training software developer specializing in post-production products for the digital producer industry. Call Box was founded in 2006 and has leveraged strategic partnerships with other digital filmmaker training specialists such as Philip Bloom and Barry Green. In addition to being an Apple Certi&#64257;ed Trainer in Final Cut Pro, Noah Kadner administers several online &#64257;lmmaking forums including 2-pop, Creative Cow and DVXuser.com and is the owner of Call Box. Noah wrote "RED: The Ultimate Guide to Using the Revolutionary Camera," a 360-page book for Peachpit Press. He also wrote about Disney&#700;s &ldquo;Tron: Legacy&rdquo; and &ldquo;Prom&rdquo; for American Cinematographer magazine. &quot;No one knows digital post-production better than Noah. Highly Recommended.&quot; - Michael Horton, Founder, Los Angeles Final Cut Pro User's Group. &quot;I count on Noah when I need advice or problem-solving to get things working right.&quot; - Larry Jordan Editor-in-chief, Edit Well, The rich-media newsletter for Final Cut Studio. Call Box products are available directly from Call Box, Tool Farm, B&amp;H Photo and Abel Cine Tech. Additional information on Call Box can be obtained on the Web at Call Box.